Local big men Isaiah Mobley and Onyeka Okongwu headline a star-studded 2019 recruiting class for the Trojans. USC as a basketball school? That could be the direction the university is headed towards with its 2019 recruiting class. Just last week they received commitments from two five-star and two four-star recruits. Local big men Isaiah Mobley and Onyeka Okungwu hail from Temecula and Chino Hills, respectively. Oungwu played with all three Ball brothers his freshman year and won a Division I state championship this past spring. Along with four-star recruits Kyle Sturdivant, Drake London and Max Agbonkpolo, USC has a total of five committed high school seniors ranked in the Top 150. That's good enough for the second-best recruiting class in the country, per ESPN.com. The Trojans' class is currently above college basketball powerhouses Duke, Kansas, Kentucky, Michigan State and Villanova. Onyeka Okungwu: Chino Hills' Okungwu chose USC over Kansas, TCU and crosstown-rival UCLA. He's a 6-foot-9-inch big man who loves to play above the rim and is an opportunistic yet patient shot-blocker. He's a strong rebounder and because he played center in high school, can switch between the 4 and the 5 positions. In his junior year, he averaged 28 points, 12 rebounds and 4 blocks per game. MaxPreps named him California State Player of the Year for his efforts. He played for AAU powerhouse Compton Magic, whose coaching staff included new USC assistant coach Eric Mobley. Okungwu is close friends with fellow Trojan commit Isaiah Mobley and his younger brother Evan, who also has an offer from USC. Isaiah Mobley: Mobley stands 6-foot-10 inches and has long arms that come in handy on the glass. Last season he averaged 20 points, a little over 11 rebounds and 2 blocks per game. The intriguing number was his 35 percent success rate from beyond the arc that could add to his versatility. He will need to add to his frame to compete at the next level, but the promise is there. He could prove to be a good replacement for senior Bennie Boatwright. He also teamed with Okungwu on the Compton Magic AAU team. Mobley's father Eric is an assistant coach for the Trojans. Kyle Sturdivant: Sturdivantis a 6-foot-3-inch point guard from Georgia who chose the Trojans over UGA. He was attracted by the fun brand of basketball that head coach Andy Enfield plays and the emphasis of togetherness that the program preaches. He is ranked as one of the best players from Georgia. He has good size for his position and, because of that, can switch between both guard positions. 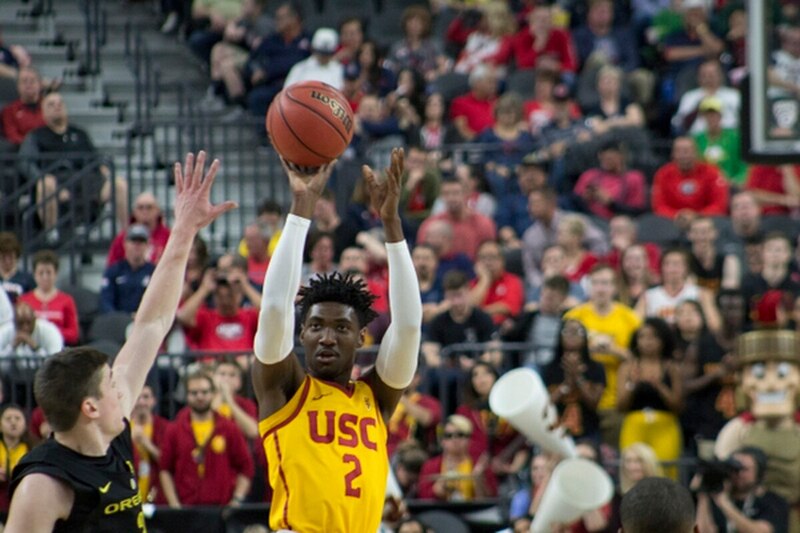 Depending on what Kevin Porter Jr. does after this season, the Trojans could be thin at point guard and Sturdivant's skill set would be welcomed. Max Agbonkpolo: Agbonkpolo of Rancho Santa Margarita is a long, 6-foot-8-inch forward who can slot between the 3 and 4 positions. Agbonkpolo also received offers from Arizona, Gonzaga, Virginia and Michigan. In his junior year, he averaged slightly over 14 points, 6 rebounds and 4.5 assists. Those numbers should increase in his senior year. He needs to increase his percentage from three-point range and beef up in the weight room before his freshman year at USC. Drake London: Moorpark's London is the most interesting recruit. The 6-foot-4-inch wing player committed to USC for both football and basketball. He initially received only football offers from the Trojans, UCLA, Oregon, Notre Dame and many other schools. But as he improved on the court, USC decided to offer him a basketball scholarship as well. Technically, he signed with the Trojans as a football commit, so as to not take one of the 13 basketball scholarships they can offer. He has real aspirations to play both sports once he is enrolled at Southern California. Being that he plays football, he provides a tough, physical edge on the court. He is an engaged rebounder for a shooting guard and has improved as a scorer. Coach Enfield should have a lot of fun with this group of freshmen when they come into town next year. Hopefully they can build off some success from the 2018 season and be true contenders for years to come.